MK Hanin Zoabi says members of the three Arab parties in the Knesset are considering running together. With elections almost certain to be called in the coming months given Prime Minister Binyamin Netanyahu's dismissal of ministers Yair Lapid and Tzipi Livni, parties from all parts of the political spectrum are preparing for the big event – among them the Arab parties. 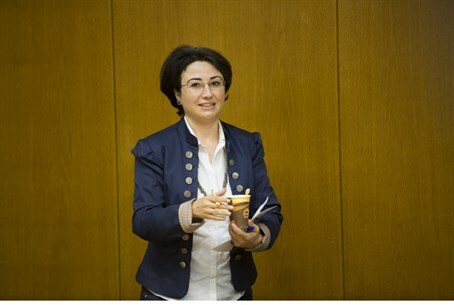 Speaking Tuesday, radical pro-Hamas Arab MK Hanin Zoabi, currently suspended from active duty, said that members of the three Arab parties in the Knesset – her own Balad party, along with United Arab List and Hadash - are considering running together. “A united Arab list will net us 16 MKs,” she said. In the past, Arab parties have attempted but always failed to come up with a common list, but this time they have a common reason to join together; under new rules instituted this year, the threshold a party must reach in order to serve in the Knesset altogether was raised to 3.25% of all votes cast. Based on Israel's current population, that would require even the smallest parties in the Knesset to have four seats - and all the Arab parties in the plenum now have only three seats. In the past, Arab parties have been notoriously vituperative to each other. They represent different interests and populations, with United Arab List associated with the Bedouin population, while Balad is more identified with the Arab Galilee population, two groups that do not always see eye to eye. Likewise there are ideological differences, as Hadash is Israel's Communist party.